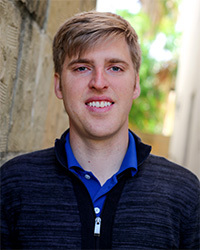 At a critical point in the state of our environment, CU Boulder welcomes a new assistant professor to the department of environmental studies: Matt Burgess. Burgess is an economist and ecologist, and brings fresh perspective to CU Boulder’s already diverse network of environmental sciences by merging ecology and economics. “Economics is the ecology of people,” said Burgess, and it is through this unique lens that he investigates our planet’s most pressing issues. Burgess’ multidisciplinary approach began during his undergraduate education. Like many students, Burgess started in one field– economics–before switching to ecology. He first conducted research with a mathematical ecologist who wanted to use economics in their research, naturally shepherding him towards a multidisciplinary career. After this first experience, Burgess continued to conduct research that straddles the boundary between ecology and economics in his graduate and post-doctoral work. Burgess himself is on the council of fellows at the Cooperative Institute for Research in Environmental Sciences (CIRES), which brings more than 800 environmental scientists together and acts as a bridge between CU Boulder and the National Oceanic and Atmospheric Administration (NOAA). This has allowed him to easily find researchers who work in a field particularly interesting to him—fisheries. Burgess has worked with Boulder scientists to learn more about bycatch, or the accidental killing of other sea life, as a consequence of commercial fishing operations. His work on this topic has helped shed light on ways to develop more sustainable fishing operations while also reducing the number of non-target species caught in the net of commercial fishing. His 2018 paper in Science suggested that managing fishery stocks to best promote long-term sustainability would also reduce bycatch. Can we make fisheries more sustainable AND prevent bycatch? Burgess thinks yes. Although Burgess has focused attention on applying his unique lens to fisheries, his interests beyond the field are anything but limited. Burgess explains that being in a landlocked state provides an exciting opportunity to branch out. Burgess is interested in the parallels that can be drawn between purely mathematical relationships and various social contexts. It’s these types of cross-disciplinary conclusions that bring about a new perspective on systems that would have ordinarily been overlooked. Burgess finds inspiration in the work of Nobel prize winner Elinor Ostrom. Ostrom conducted economic research on communities and their management of resources. She developed a set of design principles for sustainable maintainence of shared resources such as forests and fishing waters. A proponent of management at the local level, Ostrom believed individuals and local communities are best suited to prevent exploitation of precious natural resources. Burgess is interested in applying Ostrom’s principles to evolutionary biology. He believes that these equations can help us understand the conditions under which you expect cooperation to evolve, exploring how a species learned, over time, that working together at a community-level benefits their livelihood and ultimate survival. Our natural resources are under tremendous demand given today’s exploding population, so this research could provide valuable insights into how we can better manage the resources we still have. Following the laws of economics, these unique perspectives and multidisciplinary conclusions come with trade-offs. Embarking on a multidisciplinary path has both its benefits and challenges. Burgess explains that — when not constrained to a particular field — there are more opportunities to stretch beyond the usual boundaries of clearly-defined disciplines. Burgess cites two main classes of challenges to being an interdisciplinary researcher: time and scope. Burgess explains that the startup cost of good interdisciplinary work is often higher since you have to build up a much larger knowledge base. Additionally, the pool of literature is much larger, making it difficult to know what research has already been explored. The second challenge is in figuring out the scope and direction of one’s career. Professorial positions at universities tend to reside in a single discipline, so academic job searching can be more complex. Despite these challenges, Burgess noted that multidisciplinary work is gaining momentum, and that funding agencies are increasingly recognizing its value. While it may take longer to find one’s place in a multidisciplinary area of study, Burgess has demonstrated that persistence and a creative outlook can lead to a fulfilling career.